The subject metal piece is a spiral shaped metal shaving created by a defective commercial can opener when the can of tomato product was being opened by the customer. This is not a product defect; it is a result of user error. There is not enough metal present to do a reliable alloy analysis. It is enough to know if the metal component is magnetic. If it is, the metal is most likely mild steel. Analysis of the accompanying contaminant organic polymer materials (i.e. plastics) is readily done because only a very small amount of material is needed for FTIR failure analysis. In addition, the organic materials are distinct and will give definitive information on the source of the subject contaminant. An overview of the metal contaminant piece is shown in Figure #1. It is a 1.5 inch long "spiral" that appears to be a metal shaving. Figure #2 is a low power photomicrograph of a part of the metal contaminant. In this figure there are two types of organic polymer contaminants visible on the spiral. It is important to note that these contaminants are not tomato product. One is black and "rubber like" (it was found to stretch elastically). The other is a gold colored, semi-transparent film. If the black material is pulled back, the gold color material is revealed. To recap, the contaminant piece consists of a metal spiral coated with two types of organic materials. One is black and the other is gold. The cannery provided an exemplar new can top for examination. It is made from mild steel. In addition, there are two polymer materials in the seal region. There is a black material and a gold material. These are very similar in appearance to the polymers found on the subject contaminant metal piece. 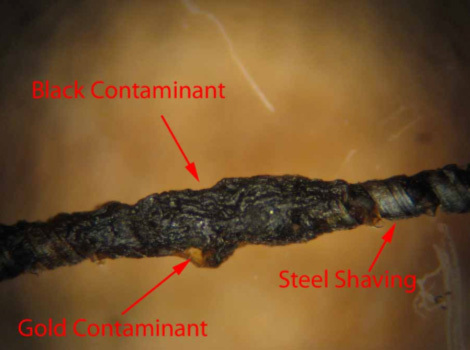 Figure #1: Photomicrograph of the metal contaminant found in tomato product. 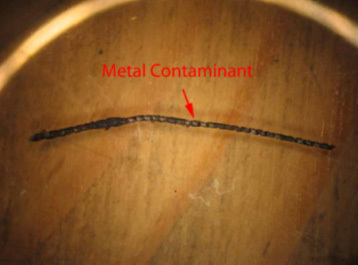 This contaminant is a spiral, and it appears to be a steel shaving (Mag. 8X). Figure #1: Higher power photomicrograph of a portion of the metal contaminant piece found in tomato product. In this view, two types of polymer contaminants can be seen. First is a thick black material. When pulled with tweezers it exhibits rubber like characteristics. In addition, one can see a gold colored, semi-transparent polymer film (Mag. 30X). The metal contaminant piece was examined visually, microscopically and with a magnet. In addition, the plastic contaminating materials on the metal spiral were analyzed with Fourier Transform Infra-red Spectroscopy (FTIR). These FTIR absorption results were compared with sealant materials extracted from a representative new can and top provided by the cannery. Figure #1: Photomicrograph of the sealing region of a representative new can top. In it one can see a black sealing material on top and a gold colored material beneath. 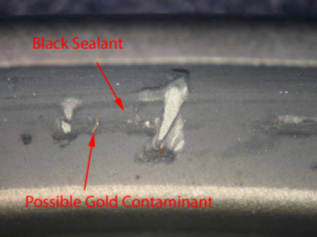 The black material was examined with FTIR and compared with the black contaminant found on the unknown metal contaminant. 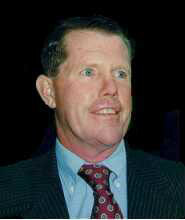 In addition, a sample of the gold material was compared with the gold material found on the unknown (Mag. 30X). Metal: The metal portion of the contaminant is Ferro magnetic (i.e. it is attracted to a magnet). In addition, has the same physical appearance of metal shavings proven to have been created by a malfunctioning commercial can opener. Plastic: The FTIR absorption results demonstrate that the subject polymer materials on the metal spiral identically match polymers taken from the seal region of the new can top. The FTIR absorption results indicate that the subject contaminant metal piece is a portion of a tomato can sealing area. The curled shape of the metal indicates that this piece was generated by a malfunctioning commercial can opener (i.e. the type found in restaurants) when the can was being opened at the customer's site. The curly metal piece is generated by the can opener; it spirals off during opening of the can and falls into the tomato product. Because the can top is opened at the seal, the polymer sealants are carried along by the spiral metal piece being created by the malfunctioning can opener. 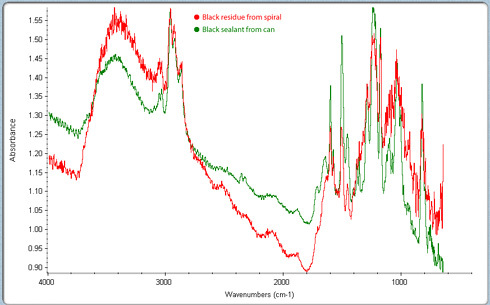 Figure #2: A set of FTIR absorption curves that compare the black material found on the subject contaminant metal spiral to the black sealant material removed from the representative new can top. The two materials show a perfect match. 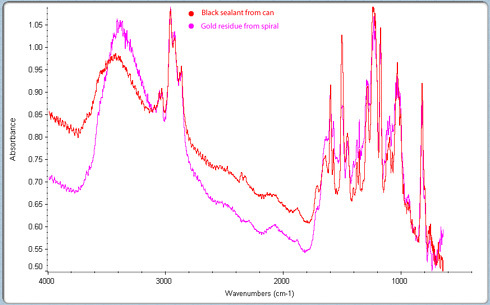 Figure #3: A set of FTIR absorption curves that compares the gold material found on the subject contaminant spiral to the black sealant material removed from the representative new can top. The two materials show a perfect match.